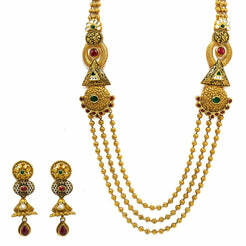 22K Yellow Gold Choker & Jhumki Earrings Set W/ Rubies, Kundan & Faceted Flower Decal for women. 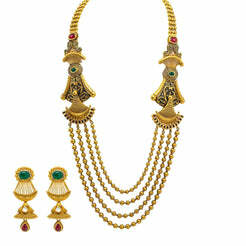 This exquisite 22K yellow gold choker & jhumki drop earrings set is embellished with kundan and rubies with a faceted centered flower decal. 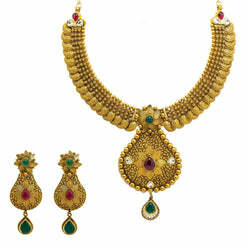 The choker is 13 inches long with a width range of 2.5-51 mm. 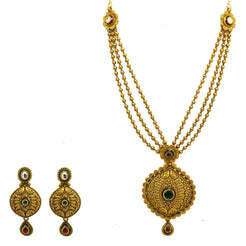 Its ornate pendant is 20 mm long and 11 mm wide. Each jhumki earring has a flower stud and is 40 mm long and 15 mm wide. The set has a total gold weight of 68.3 grams.